Kanchenjunga located in Taplejung district north east of Nepal (8598m) is the third highest mountain of the world after Everest of Nepal and K2 of Pakistan. Kanchenjunga trek area bordering to India in the east and Tibet in the north is very remote and very less explored part of Nepal. 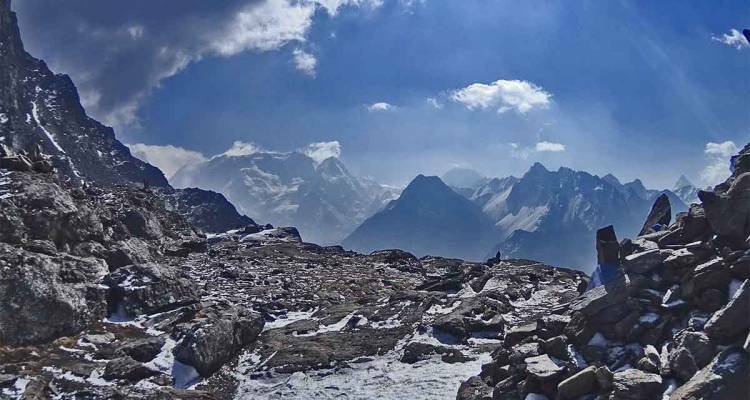 Kanchenjunga trek offers some of the excellent views of Himalayas, Glaciers and to experience the village life that very few trekking routes offer. Kanchenjunga trek is long and excess to starting point of the trek is bit time consuming and combining both north and south part makes exceptional adventures trek in Nepal. The trek starts walk through villages and and lots of black cardamom can be seen in lower part of the trek. Starting in the northern part there are lots of climbing to be done, passing by villages of Limbu people old monasteries, beautiful bamboo, and oak and pine forest, lots of suspension bridges. Some of the trekking trail in north is rough and have to careful. Highest trekking point of the north is Pang Pema, it is the northern base camp of Kanchenjunga. The trek crosses and over the high passes (4660m) Margin La, and Sinela @ 4700 meters to get to southern part of the trek. Walking trail are mostly on old moraines in higher part of both in north and south of the mountain. The vegetation in lower are lush green sub tropical type to alpine and higher above 3800 meters are low alpine where grass can only grow. 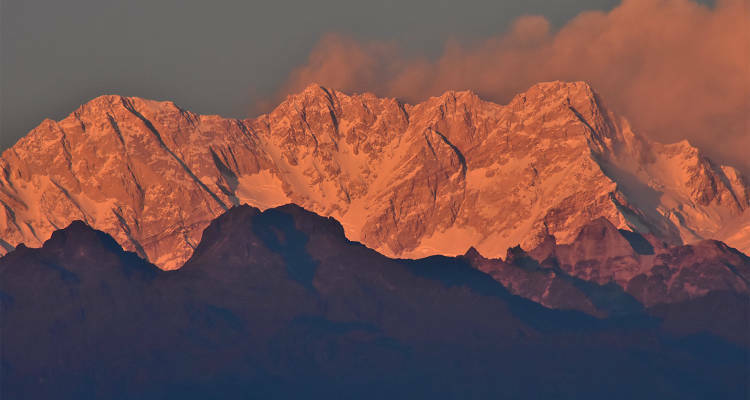 Kanchenjunga is the host for some of the wildest and endangered animals of the world. The conservation area is famous for the wild life where people could see snow leopard or Red panda in a lucky day. Kanchenjunga trek can be compared to Dhaulagiri Trek or Manaslu trek from the east of Nepal as some of the best trekking places in Nepal. Take a trip to the famous Tea fields of Ilam at the end of the trek can be a pleasant moment at the end. The adventure and the culture goes hand in hand in this trek before going 3500 meters. 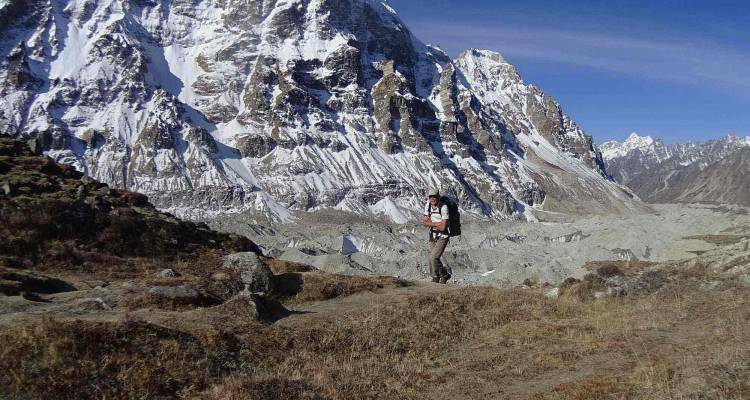 The less explored Kanchenjunga trek area is an ideal place for trekking and nature lovers. Starting point: Suketar Airport foot. Ending point: Suketar Airport or (ILam will be two days more). Best trekking season: trekking March to mid of June and October to mid of December. Total trip days: 21 days trek, Suggested 2 days in Kathmandu. Walking hours: 6 hours on average. Accommodation during the trek: Tea houses/ lodges/ camping. Accommodation in Kathmandu: 2* Hotel/ 3nights (Hotel upgrade available in interest). Highest point of the trek: 5140 meters/ 16860 ft.
Trek to the unchanged natural and fresh area with very less trekking people. Get to the glacier on the north and south to the height of 5140meters/16860 ft.
Get in touch with the different ethnic (Rai and Limbu) friendly people and feel their warm hospitality. Day 01: Fly from Kathmandu to Bhadrapur, Drive to Ilam 5 hours. Day 02: Drive From Ilam to Taplejung (1815m), 5 hours. Day 03: Trek from Taplejung to Chirwa (1,270m), 5-6 hours. Day 04: Trek from Chirwa to Sekathum (1,660m) 500m uphill, 6-7 hours. Day 06: Trek from Amjilosa to Gyabla (2,730m), 250m uphill, 5-6 hours. Day 07: Trek from Gyalba to Ghunsa (3,595m), 690m uphill, 6-7 hours. Day 09: Trek from Ghunsa to Kambachen (4,100m), 750m ascend, 5-6 hours. Day 11: Trek to Lhonak (4,785m), 650m uphill, 6 hours. Day 12: Trek from Lhonak to Pangpema (Kangchenjunga North Base Camp-5,140m), 380m uphill, 5hour. Day 13: Trek from Lhonak to Ghunsa (3,595m), 1280m downhill, 5-6 hours. Day 14: Trek from Ghunsa to Sele Le (4300m), 6-7 hours. Day 15: Trek from Sele Le to Tseram (3,870m), 6-7 hours. Day 16: Trek from Tseram to Ramche (4,730m) and up to Oktang (4630m), back to Ramche 750m, 5 hours. Day 17: Trek down Ramche to Torontan (2,995), 5-6 hours. Day 20: Trek from Pumphe to Kunjari (1700m), 960m uphill, 950m downhill, 6-7 hours. Day 21: Trek from Kunjari to Suketar 1150m uphill, 470m downhill, 8-9 hours. Day 22: Drive from Suketar to Bhadrapur, 9-10 hours Drive. Guides and porters wages for 23 days including fooding and lodging expenses. Transportation by bus or Local jeep to Taplejung. Three permits: National park permit 20$, Trekking permit 10 per week, Tims card 10 per person. Flight to Bhadrapur, which is 157$ per person one-way. flights prices can change and incase of increase in flight price, additional price will be asked form the clients. Notice: Due bad weather during winter (January /February, winter and July/August monsoon season, the flights can be cancelled or delayed for few days so we advise you to have few days extra if you are planning for mentioned season. Flights to Suketar is once in a week by private airliner and three days a week by national carrier (Sunday, Wednesday and Friday). Our suggestion would be flying from Kathmandu to Bhadrapur and drive to Ilam and then to Suketar. Best season for trekking: March to mid of June spring and October to mid of December autumn and start of winter season. Day 01: Kathmandu to Bhadrapur fly: Drive from Bhadrapur to Ilam, 4-5 hours. There could be easy option of lying from Kathmandu to Suketar but we cannot relay on the flight to Suketar because they have very regular flight cancellation so we would suggest flying to Bhadrapur. The flights can delay due to air traffic or bad weather so our drive on this day only to Ilam which is 3 hours by car 5 by local Bus. Ilam is hill station famous for tea garden and beautiful views of Himalayan Ranges. Day 02: Taplejung by Local Bus, to 1700 meters. 5 hours for drive time. 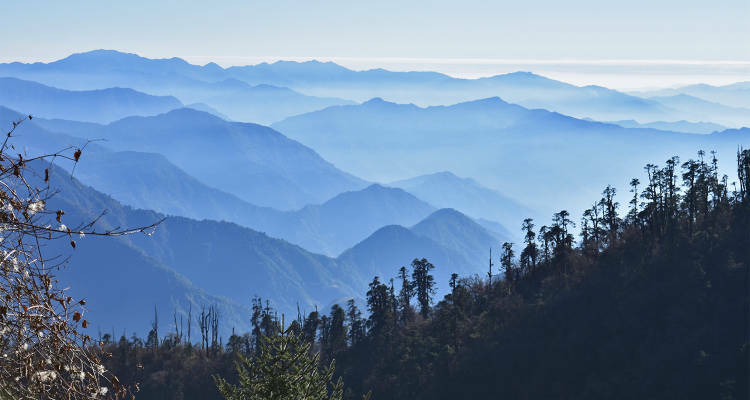 Driving from Ilam to Taplejung is a long journey through the hills with lots of twist and turns. it is a 5 hours long driving day by Local jeep or Bus. Day 03: Trek from Taplejung to Chriwa (910m), 5-6 hours. The first day of the trek starts with some ups and downhill. As we trek on this part of the trek we will come across lots of farming fields with beautiful views of villages to Tawa. After some time we will walk along the Tamur River and climb and down to Mitlung which will take few hours. From here it is easy long walk to Chriwa @ 910 meters next to river and low hights uphills and downhill. Day 04: Trek from Chirwa to Sekathum (1,660m) 500m uphill, 5-6 hours. Our today's last destination Chirwa is village settled by the Limbu majority. Lumbu are the people rich in culture and their history and they have their own local language other than Nepali. For first few days our trek starts with ups and down next to Tamur River and get to Sinwa and then descend to Tawa, from here we climb up and cross the suspension bridge then walk to Chirwa. Today we will pass by the famous cardamom field following the Tamur River and the dense forest. Following the trail we come to permit check point in Thaplethok, cross the bridge and climb up to Olagchunchung Gola) and trek for some time for up and down hill to Ghusana river before reaching Sekathum at 1660m. As usual after breakfast we start our day next to river. This valley gets winds as the valley is narrow and we will have some ups and downs though most of the day we climb, after the first uphill we get to up to Ghaiyabari at 2160m. A tough day will be over after we climb steep up and then down from Ghaiyabari to Amjilosa village situated at 2505 m. It is a step up climb to Amjilosa after crossing the suspension bridge. Day 06: Trek from Amjilosa to Gabyla, 400 meters uphill, 230 meters downhill 4-5 hours. The day is easier and refreshing with the view of waterfall, than the other days done before though this day too we will have to climb up. After the uphill we will get to the Gyabla Village at 2730 meters of Sherpa or Sherwa people are famous all over the world for climbing the high Himalayas). On this day you will notice the change in vegetation and can see the bamboos and rhododendron are smaller than lower height. Day 07: Trek from Gyalba to Ghunsa (3,495m), 690m uphill, 6-7 hours. Today we start our days with downhill and then gradual trail next to River and then the pastureland and potato fields to arrive to Phole. Phole situated at 3210meters has lots of teashops and a very old Gompa with old books and statues, which is the settlement of Tibetan refugees. After Phole we trek up to Gunsa at 3495 the largest settlement that we will see on this trek. The place had the tragic accident when 23 people died including the high level officers of WWF and Nepal's officials for nature conservation. Day 08: Acclimatization at Ghunsa (3,595m). An acclimatization day is required before heading higher to next destination. A short walk to a higher Place and then trek back to Ghunsa helps us to acclimatize and rest. A hike to Lapsan La Monastery is a good option. Day 09: Trek from Ghunsa to Kambachen (4,100m), 750m ascends, 4 hours hours. Day 10 Acclimatization day at Kambachen (4,100m). Another rest day and acclimatization at Kambachen is suggested to have to make our body more used to the height for the latter days. We will hike up and short exploration around the valley and come back to Kambachen. A day for photography. Day 11: Trek Kambachan to Lhonak (4,785m), 650m uphill, 4 hours. A long day that starts with gradual uphill along the river and next to the moraine and come to place called Ramtang at 4350m with a monastery in here. After we will cross over some landslide, descend to river and then to Lhonak. Lhonak is another place from where you will have very scenic view that will keep you mesmerizing by the beauty of the nature. Day 12: Trek from Lhonak to Pangpema (Kangchanjunga North Base Camp, 5140m) back to Lonak. 380m uphill, 380 meters downhill 6-7 hour. One of the main days of the trek of Kanchanjuna trekking, as we will walk over the moraine (old glaciers). The day is easy as we walk gradually to the camp. Pang Pema at 5140m/168592foot is the northern base camp of the world's third highest mountain world Kanchanjunga 8586m/28162 foot. Other peaks that you will see on the way to Pangpema are taple shikhar (6510m) Gimmigela Chuli (7350m) Pyramid peak (7168m) Kirat Chuli or also called as Tented peak (7365m). (Option an extra day is advised to take picture and have better view. Later walk back to Lonak at 4785 meters. Day 13: Trek from Lonak to Ghunsa (3,595m), 1020m downhill, 6-7 hours. As we have made it to the base camp of Kanchanjunga we descend back to Khambachan taking the same trail as we came up. Going down is quicker but not as easy as thinking so we will walk slow and go further and get to our destination to Kambachen making the descend of more than 1000 meters. The trek goes further downhill to Ghunsa and this will take less then what took us coming from same place. The trek now again passes through the Pine, Rhododendron forest. Again the rough trail that needs to be crossed so please follows the guide's instruction. A long day and challenging up hill will take us to Tamo-La (pass) 3900 meters. The trail passes through pine forest and then to rhododendron shrubs and climbs all the way to Sele. Sele is place, which is surrounded with rocks, and grass fields, which is a grazing for Yaks in summer. We will start early morning from Sele-La, our walk will be gradual and steep, as we get closer to the pass we will have steep to climb and there will be three passes on this day. The last pass is Sinela Pass which is at 4700 meters once we cross this then we will be going steep down to Tseram @ 4630 meters. Day 16: Trek from Tseram to Oktang (4,730m) and down to Tseram (3870m), 1240 meter uphill 1240,m, 6 hours. Tseram is an acclimatizing place for people who trek from south to north. This the last place on the tree line before heading up to Oktang. Oktang is southern base camp of Kanchenjunga Mountain. The southern base camp is just next to Yalung Glaicer, from here you can have the view of Kabru Himal (1, 2 and three) 7412 meters, Rathong 6682 meters and Kanchanjunga Himalayan Ranges first 8587 meters. The hiking area is best natural home to world-renounced animal Snow leopard. Day 17: Trek down Tseram to Torontan (2,995), 3-4 hours. The hike from Tseram to Torton is easy and beautiful; the trail follows Simbu Khola all the way to Tortong. There are few places, which are being used for grazing Yaks for summer season. There is also a religious sight for the locals. We will be passing by beautiful pine and rhodhodendron forest all the way to Tortong situated just next to Simbuwa Khola @ 2995 meters. Day 18: Torstang Cross Lasiya Bhanjyang (3,500m) to Yamphudin 7-8 hours. It will be a long and challenging day. The first part of the day will be a steep climb all the way to Lashey Bhnagyang @ 3400 meters. It can be quite cold in the morning as the trail is on the other side of the hill, which blocks the sunlight. Few bottles of water is needed as it can be thirsty and once we get to Lashey Bhangyang we can have some snacks or chocolate bar or our pack lunch because there is no proper lunch place. 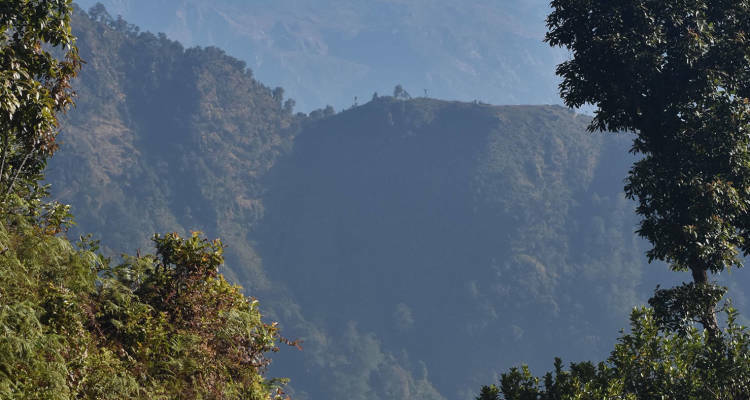 After Lhasey bhnagyang we will trek all the way down to Amji Khola passing oak trees and bamboo forest and this place is famous for another endangered animal called Red Panda found in Kanchenjunga Trekking area. Then we will go gradually with few ups and downs all the way to Yamphudin @ 2100 meters. Day 19: Trek from Yamphudin to Pumphe @1885 meters, 715m uphill, 590m downhill, 5-6 hours. Day 20: Trek from Pumphe to Lalikharka/ Kunjari/ (2100m), 1260m uphill, 1100m downhill, 4-5 hours. The day will be short and beautiful; we will have an easy walk for around three hours before we start our up hill. Now as we are getting to lower elevation we will be passing villages, so the first village will be Yangpang, It is quite a big village with more farming land. We will be walking from Yangpang to Phung phung Danda through farming fields and few waterfalls. We will have a step walk all the way to Kande Bhangyang @ 2124 meters, which will be our resting, point for the night. Day 21: Trek from Trek from Lali kharka @1940 meters to Deaurali 2600 meters to Suketar 2400 meters, uphill 600 meters hours 6-7 hours. Trek from is another long day hike; there are no proper lodges to stay so it will be like home stay. The start of the trek will be easy for 30 minutes then the trail goes down hill all the way to Shimbu Khola. Once we are in Shimbhu Khola we will start our climbing all the way to Kunjari. The main village of is just below the trekking trail. The trek starts with the uphill through fields and forest all the way to Deurali. Once we get to Deurali we walk gradually all the way to Syketar @ 2400 meters. From Suketar we can take a flight to Kathmandu directly or we will walk for another hour all the down to Taplejung @ 1900 meter. Day 23: Fly from Biratnagar to Kathmandu. Notice: Due bad weather during winter (January /February, winter and July/August monsoon season, the flights can be cancelled or delayed for few days so we advise you to have few days extra if you are planning for mentioned season. Best season for trekking: March to mid of June spring and October to mid of December autumn and start of winter season. Flights to Suketar are operated by few airline companies and should be booked in advance. Due to unpredictable weather flight can be delayed or cancelled form few hours to couple of days. We suggest you to have few back up days or fly to Bhadrapur and drive to Ilam and next day drive to Suketar and start the trek, return will be same. Do I need to carry my luggage myself or will there be porters to carry my bag for me during the trekking days? We would recommend a haversack or a trekking bag and we provide 1 porter for two people. A 45 liter bag for yourself if you want your big bag to be carried by porter.